Sidekick makes Slack groups easier to manage and more enjoyable to be in. Group members can easily contact all group moderators at once using Slack’s new Dialogs feature. How many members are in your group? How many bots? Who’s online right now? Find out with a click of a button. Learn more about bots and other integrations in your Slack group. Track topics interesting to your community and easily share tweets with your Slack group or your Twitter followers. Share a tweet with Sidekick to have it retweeted, no need to switch accounts back and forth. Keep your group nice and organized and move messages to more appropriate channels when necessary. Sidekick also lets you send private notifications and shows automatic contextual reminders. 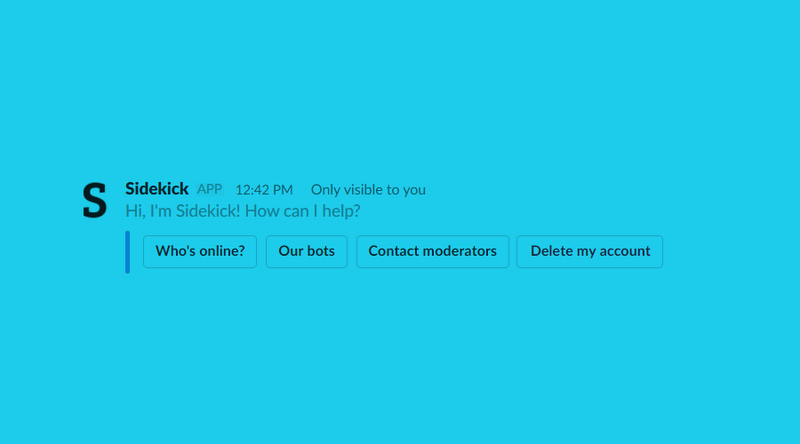 Sidekick is under active development and everyone is welcome to help add new features in our Botmakers Slack group ?